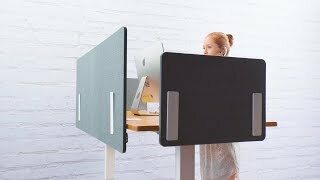 What are desktop acoustic privacy panel holders for? When building your ideal workstation, one with the right amount of privacy for you and your work style, you might have already come across our acoustic privacy panels. If you want the option to install panels on almost any flat surface for an instant way to increase privacy, our desktop acoustic privacy panel holder gives you the ability to do just that. Slide your panels into the slot on the holder and place the holder where you wish to create a wall to stop work distractions before they get to you. What colors do these come in? At this time, desktop acoustic privacy panel holders are available in your pick of black, white, and gray powder-coated color options. Match or mix and match to create the workspace that helps you work. What are those compartments on the sides of the holder? That's a little extra desk storage, just for you! Got an unexpected office guest stopping by? Toss your notes, stapler, and any medium and small desktop items in it for a quick way to organize your space. The Desktop Acoustic Privacy Panel Holder comes in a monochromatic color scheme of black, white, and gray. These panel holders are great for a flexible workspace as they turn your Acoustic Privacy Panels into easily repositionable partitions. This product comes standard with a limited 5-year warranty. For more information on UPLIFT warranty coverage, click here.